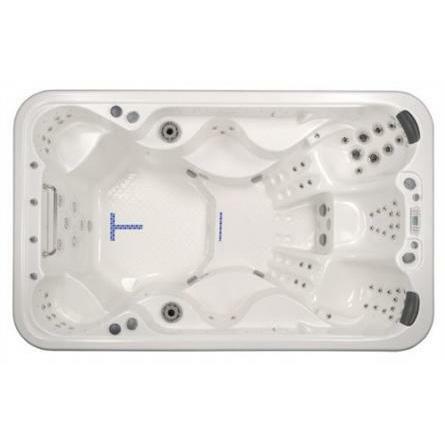 12ft x 7.5ft x 53"
The Vita XStream Sport XSR is a 9 seat hot tub with a swim zone. Powered by 3 4.8bhp pumps, this is a superb hot tub and swim spa hybrid, a great solution if you want to combine the need to swim with the fun of an extra large hot tub. This would be a great addition for any large holiday cottage or private home where you want the facility to swim and the fun of a hot tub without the full expense of running a full size swimming pool. With a range of features including a built in MP3 and Bluetooth stereo system, the XStream Sport XSR is perfect for having fun in and enjoying the full low impact benefits of swimming. With a range of features including four exercise attachments and a stainless steel exercise bar, the XStream Sport XSR is designed to help you get the best out of both worlds. This huge 9 seat hot tub has 70 jets in total for the full hydrotherapy experience combined with underwater lights and a rowing kit. Built to the very high standards that Vita are famous for, the ease of use of this 9 person hot tub swim spa is fantastic along with the latest high specification build quality including a stainless steel frame, it is a fantstic combination of both swim spa and hot tub. The XStream Sport XSR is available to buy from Bay Spas with delivery and installation as well as a full after sales service.